Forests are gifts from Mother Nature, and the lumber mill is where we make our own treasures out of wood. However, due to excessive deforestation, this precious property of mankind is quickly disappearing. Maybe it’s time to stop now, what do you say? The Lumber Mill is one of the very first buildings in the game. The Lumber Mill produces Woods overtime. The Lumber Mill is one of the four resource production buildings in Rise of Kingdoms beside Farm (for food), Goldmine (for gold) and Quarry (for stone). 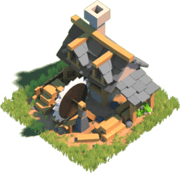 By upgrading the Lumber Mill, you increase its production speed and the maximum Wood capacity. Players can get the lots of rewards by upgrading the Lumber Mill.